Last month, The Guardian posted the findings of a survey of 2,000 British children and parents focused on the impact technology is having on the younger generation. Unsurprisingly, with the rise of tablets in the household, kids are reading less and less. It makes sense, in a way, as back in my day there wasn't a whole lot to do other than read as a kid who got booted off the family TV so your parents could watch something other than you playing Nintendo. Now days? Junior can happily plug away at Angry Birds for hours on the old hand-me-down iPad. This is where kids and family game developer No Crust Interactive comes into play with the release of Strike & Prejudice . 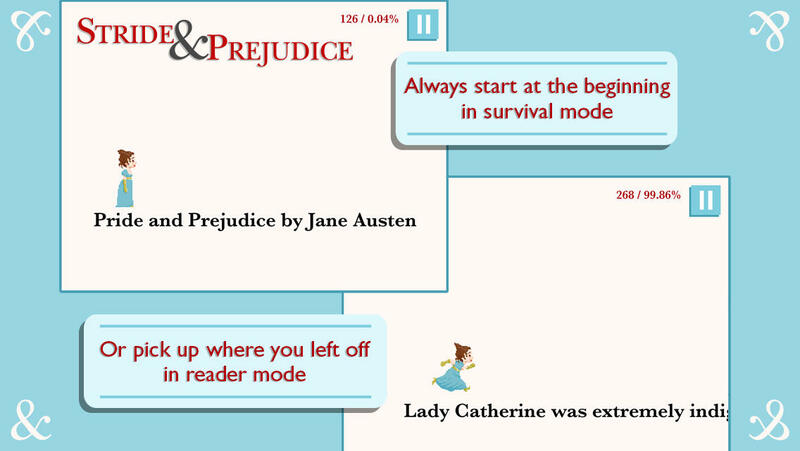 In a nutshell, it's an endless runner with the similar gameplay and controls that we've seen in the bazillion other products in the proverbial "Runner" aisle on the App Store, with one major difference- The platforms you run on are the actual text from Jane Austen’s Pride and Prejudice. It's got two game modes, "marathon mode" which always starts at the beginning of the book with your progress judged by how deep into the book you make it before dying and "reader mode" which always starts you off where it left off. Playing Stride & Prejudice is an odd experience, as your brain's platformer muscle memory kicks in and controls your pixelized Lizzy Bennet easily hopping between sentences as you can't help but read the text that's scrolling by. The platforming itself is on the easy side, and Pride and Prejudice is a great book so you find yourself playing way longer than you typically would play a otherwise basic runner. I'm not sure how much I'd recommend downloading it, as obviously there are better runners out there, and bouncing along sentences will never compare to something like Canabalt ... But, it's a really clever concept, which deserves some form of virtual hat tip, if nothing else.